Yesterday I shared how almost nothing astounds me more than the ability God has given each of us to choose. To head left or right. To say yes or no. To forgive or hold onto a grudge. Most of our life happens as a result of our combined choices. Not happy with your current situation? It is not only the outside influences you need to examine, but within. 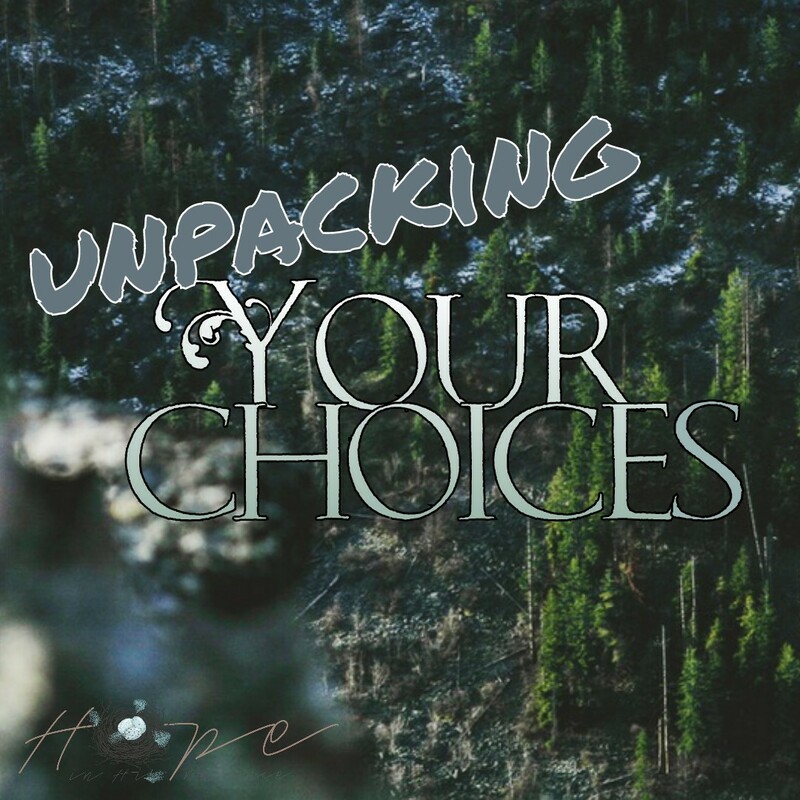 For if you won’t unpack your choices, you will keep making them. and head in the same direction. Let me share two ways I learned this lesson. I have a relation who suffers from a combination of bad choices and mental illness. Many of the family stepped in to assist during some pretty traumatic and rocky circumstances. There was a lot of resentment towards those who helped out, because it wasn’t her choice to have us help. I ended up the target of her rage. After all I had poured out in time, love and effort to help, I was devastated. God gently held me as I cried, sent a familiar face to speak His love to me, helped me to forgive her, and clearly released me from assisting moving forward. In fact, her choice to speak to me that way ended up with consequences which broke open the fact she was dealing with mental illness and she began to receive more support services in her local community. The result is I don’t visit very often anymore. As much as I love this person, I do not need to be in direct contact with them anymore, and I can serve them best by interceding for her in prayer. The result of her bad choice resulted in my choice not to put myself in her target zone again without proper cover. The other situation was one I unwittingly created through my unwise choices. I missed a deadline as I allowed myself to follow the lie that I couldn’t write without waiting for a spark of inspiration. My choice to ask for extra time because of my self doubt caused undue stress on my editor. The organization’s head (rightly so) lovingly reprimanded me, and brought the situation into the light to see it for what it was. The result of my bad choice. Instead of seeking God, i sought the shadows in which to hide. After surrendering my writing yet again to God, I apologized and gave myself a pre-deadline for my next deadline, so this situation will not occur again. Positive choices are needed to help us move forward towards the life we want to live. Not eating healthily over long periods of time results in health problems. Excessive drinking and smoking negatively affect the body. Severe sleep deprivation and unsupported depression can play havoc on the mind. Unforgiveness and nurturing grudges can shut down our emotions. Negative choices result in negative consequences. What I appreciate most about God allowing us the freedom to choose? The choice we have to bring our bad choices and repercussions to God. For He never leaves us the way He finds us, in the heaping piles of squalor we lie blubbering as our choices return like a boomerang to knock us off our feet. God not only helps heal us of the fall out from our bad choices, He helps us to make better ones. He also guides us to see the options He has for us, so we can get a sense of the results of our choices before we even make them. Prayer and the Word helps us to make healthier choices, and change our lives for the better. That decision to forgive will set you free in ways you may not even realize for days, weeks or years to come. That choice to stay and work it out may give you the solid foundation your marriage needs, because of your dependence on God to be the Rock it is based upon. That no you respond with frees you up to say yes to where He really wants you to use your gifts, and the joy within knowing you pleased Him by choosing His way outweighs the disappointed look of the person to whom you said no. Your choices can unpack your life for the better when you invite Him to show you how to do just so. Or add more weight and struggle to your load.